Making your own dehydrated meals for backpacking is an excellent way to reduce the weight of your bag, save money and enjoy comfortable, tasty and quick food throughout your outdoor adventure.So, are you ready to transform the way you eat while on the trail?If your answer is yes, then you will like what we have prepared for you in this article. Whether you are going out for three or 300 days, you have got to eat, especially when you are hiking and walking 10 hours a day, carrying a pack on your shoulders. Unfortunately, the options for meals on the trail are limited.But, it doesn’t have to be this way. You can make your own snacks at home with a little dehydration and preparation.So, if you own a good-quality dehydrator, you should start drying the food and amaze your friends including yourself with your culinary creations. With it, you will make the most delicious, healthiest homemade meals, desserts and snacks for backpacking. And any dried meal will come to life using boiling water.Without further ad, let’s dive in. There is always an option of going to the store and purchasing the dried meal there. But we have some reasons to believe that homemade dehydrate food is the best one. You can create recipes to fit your taste and satisfy your needs – Raw, Gluten-free, Vegetarian, Vegan, etc. This way is cheap – if you are buying those store brands, you will end up paying up to 11 dollars per one serving. And if you ask us, that is a lot for that kind of food. The fact that you made the meal that you will eat on the trail is fun. You will feel more useful. Depending on your personal needs, you can control the portions, whether you want smaller or larger ones. If you eat right out of the bag or container where you prepared the meal, you won’t need to clean up after you finish. You will be able to handpick the ingredients you want to include in your recipes – gluten free, chemical free, organic, etc. To satisfy your appetite and taste, you can make a variety of snacks, desserts, and meals. The only cooking you will have to do on the trail is to boil the water. So, it is pretty easy also. Read more about health benefits of using dehydrated food. First of all, you need to own a good dehydrator, and if you don’t, it would be wise to consider having one at your home. These units are a great addition to your kitchen. Thanks to them you will be able to make a lot of great dried food. The fantastic thing about them is that they evaporate all the water out of the meals. That way, you will have snacks that can last for a long time. And yes, it is possible because the food loses all of the moisture and that way it cannot spoil. You should cut the ingredients that you want to dry, into small pieces. That way they will be able to dehydrate easily and quickly. Bear in mind that the parts be ¼ inch thick or less. If you are making single ingredient meals, don’t mix it in the dehydrator with other ones. It will cause the flavors to mix. It would be a bad idea to dry the blueberries and the meat together. You don’t want the chicken that tastes like strawberries or vice versa. 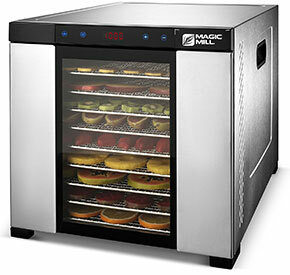 To make your dried meal safe to eat, you should always check the temperature on your unit. Bear in mind that the different food will need different heat. To enhance the longevity of the homemade backpacking meals, you should store them in the freezer. Label them with the date you dehydrated them and the content outside of the container or a bag. The great thing is that they can last almost three years when stored properly. Dehydrate your food with a minimal amount of oil as it tends to go rancid and doesn’t dry. If the food is greasy, you should always rinse it. For example, when you are making beef jerky make sure to wash the meat with the warm water before you dehydrate it. Pasta dishes, pot meals, hearty soups, stews, and casseroles all sound delicious. Chop all the ingredients you want into small pieces and cook the meal as you would typically do. When you have prepared the meal, you can place it in the dehydrator. After the dehydration process, you should store them in Ziplock bags or airtight container, and put them in the freezer.When you are ready to eat one of those delicious one-pot meals, all you have to do is soak them in the boiling water for about ten minutes. And we need to admit that there is nothing better than having your favorite meal in which you can enjoy right in the middle of nowhere. Dried veggies, fruits and meat as snacks are a great addition to your backpacking meal plan. Keep the temperature of the unit at 115 degrees F or lower. That way the food will keep the raw goodness. 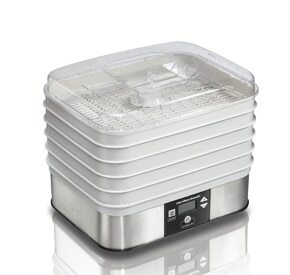 Organic fruits and vegetables are particularly delicious when prepared in the dehydrator. And the beef jerky is an excellent snack that can boost your energy while walking for hours. The best part about it is that, you can always rehydrate it and get a delicious meal. There is nothing better than having a delicious smoothie for breakfast on the top of the mountain. They are healthy and super easy to make. All you have to do is blend the ingredients you want, such as fruits, veggies, flax seeds, honey, quinoa flakes, and oatmeal, and add the milk. Dry this mixture until it is brittle. After the dehydration process, break it into pieces and freeze. Then use these frozen pieces and grind them to make a powder. When you are ready to eat, just add water. Eat better for less by drying your own meals for backpacking in the dehydrator. Use our tips to make some tasty recipes and be ready for your next outdoor adventure. You could also check our other dehydrated recipes that you can use for your trip.